After reading A Dangerous Affair by Caro Peacock for the HarperCollins First Look Program and the adventures of Liberty Lane, I decided to pick up the first in the series to see how Liberty’s exploits began. 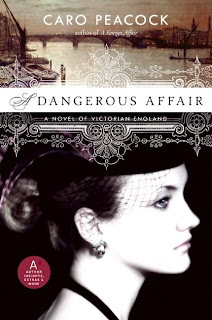 Check out my review of A Dangerous Affair here. 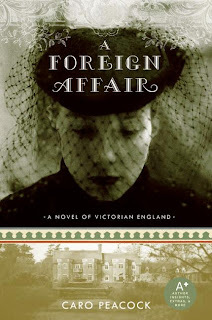 A Foreign Affair by Caro Peacock is set in England and France prior to the ascension of Queen Victoria to the throne of England. Liberty Lane is staying with family when she receives word from her father that he will be returning home from Paris shortly. Rather than wait for him to return, she runs off to Dover to meet him, but she soon learns of his death. Liberty’s impetuous nature leads her into dark alleys, a morgue, carriages with duplicitous men, and a household full of secrets as she attempts to uncover the truth behind her father’s death. She refuses to accept the news that he died in a dual, and she is enlisted by men of influence to spy on the Mandeville household while feigning to be a governess. Readers will enjoy how Liberty’s relationship in this novel develops into more of a friendship in the second novel, rather than the fatherly relationship we see in A Foreign Affair. Liberty is a Victorian Age Nancy Drew, led by her impetuous and curious nature to solve mysteries. Peacock’s use of language unfolds the intricate relationships between the characters and the mysteries in this novel. Caro Peacock grew up in a farmhouse that‚ for most of her childhood‚ contained half a dozen brothers‚ sisters and cousins‚ twice as many cats and dogs‚ no central heating and one bathroom that stopped working every time the spring that supplied it silted up. This possibly bred the habit of curling up in a quiet place with a book and‚ later‚ a passion for travel that led to a rather disrupted education. Somewhere along the line‚ she acquired a great interest in Victorian history − which she considers a much misunderstood period − and particularly the part played in it by independently−minded women. Caro Peacock’s A Dangerous Affair: A Novel of Victorian England is an advanced reader’s copy I received through the HarperCollins First Look program and will be published by HarperCollins’ Avon imprint on Jan. 27, 2009 in the United States or early February 2009 in the United Kingdom. A Dangerous Affair is the sequel to A Foreign Affair and picks up with Liberty Lane right after the passing of her father. Her brother is away working with the East India Trading Company, and Liberty is left to earn her way in London as a music tutor. 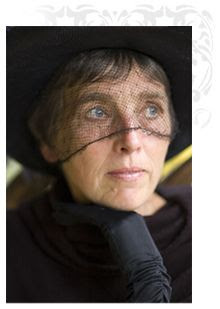 Her meager wages allow her to share lodgings with Mrs. Martley and she takes solace in riding her horse, Rancie, a gift from her father before his death. She has a network of friends who loved her father and have opted to care for her as well in his absence. David Suter is one of those friends and he composes music and leads orchestras at local theaters for a living. This novel is set in London during the Victorian period, though the actions and language in the novel are more modern than a typical novel of this period. Despite this one drawback, readers will be easily sucked into the story as Liberty seeks to free the wrongly accused after a not-so-well-liked dancer, Columbine, is murdered backstage. From the prominent Mr. Disraeli to Amos Legge who works in the livery, the cast of characters in this novel aid Liberty in her quest to save David Suter’s friend even at the expense of her own pride. The Old Bailey and a number of other prominent landmarks make it easy for readers to discern where they are in London as Liberty adorns her Sherlock Holmes’ deerstalker to track down the real killer of Columbine. This is an entertaining read with a variety of twists and turns. 3 copies of Breathing Out the Ghost by Kirk Curnutt are up for grabs here. The deadline for this international contest is Jan. 17.